The 11th Street Bridge Park is an ambitious project that will connect Washington DC Wards 6 and 8 by replacing a retired bridge across the Anacostia River. The new 11th Street Bridge will be the city's first elevated public park built on the piers of the old bridge. The Bridge Park will feature local food, recreation, health, and the arts. The UDC College of Agriculture, Urban Sustainability, and Environmental Sciences (CAUSES) is a key partner in the project and has worked with community groups to anchor the bridge park through community gardens, food production workshops, and nutrition classes. Over 200 raised bed gardens have been built, and Ward 6 and 8 residents have learned to grow and prepare food. While the Bridge Park builds a physical bridge, the community work of CAUSES brings the social and cultural aspects of the project into focus. 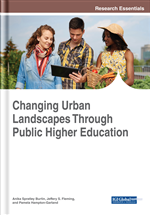 This chapter describes the transformative work of empowering urban residents to grow food and to use their local expertise in collaboration with CAUSES land-grant specialists to improve their economic condition and adopt healthier lifestyles. Universities have long played a crucial role in building the economic development capacity of the communities and regions they serve. This capacity building role is especially pertinent for land-grant universities. Their mandate is to expressly serve their states and local communities through applied research and community outreach programs that became, known as cooperative extension services. Founded in 1862 the original capacity building mission of the land-grant universities was shaped by the agrarian economies of the time, and land-grant Universities became almost synonymous with agriculture and natural resources management. Since then the capacity building mission of the land-grant system has been broadened considerably to include water, food systems, nutrition, the health sciences, alternative energy, climate change mitigation and a range of other issues. The University of the District of Columbia is the public land-grant University of Washington DC. Its mission is unique among the family of land-grant universities. The District of Columbia is neither a state and nor a typical municipality. It is a unique administrative entity located in the exclusively urban environment of Washington DC. This makes the University of the District of Columbia the only exclusively urban Land-Grant University in the United States, and its College of Agriculture, Urban Sustainability and Environmental Sciences (CAUSES) the only land-grant college with a focus on Urban Agriculture, Urban Sustainability, and Urban Capacity Building. The land-grant work of CAUSES is carried out through five centers: (1) Center for Urban Agriculture, (2) Center for Nutrition, Diet and Health, (3) Center for Sustainable Development and Resilience, (4) Center for Architectural Innovation and Building Science, and (5) Center for 4H and Youth Development. Project specialists in each of the Centers have research, community outreach, and teaching responsibilities in the academic programs of CAUSES. This ensures the close collaboration between community outreach and capacity building research, and between academic and land-grant programs to the benefit of DC residents and UDC students. Frequently, the land-grant work of CAUSES engages community partners that form a link to specific neighborhoods and economic development initiatives within the District of Columbia. The 11th Street Bridge Park project exemplifies such a partnership approach to advancing the urban capacity building work of CAUSES. The project is carried out by a consortium of nonprofit organizations, including the Far Southeast Family Strengthening Collaborative, Art Reach at THEARC, and CAUSES. The partnership represents unique strengths and areas of expertise all dedicated to the common goal of building an elevated bridge park across the Anacostia River, which has historically been a dividing line between the more affluent, predominantly white neighborhoods in the west, and the less affluent, predominantly African American neighborhoods in the east of the city. The new 11th Street Bridge Park will be built on the pillars of the old 11th street bridge and will be the first dedicated walk-able space connecting Fairlawn, Congress Heights, Historic Anacostia and other neighborhoods east of the Anacostia River to neighborhoods west of the River. CAUSES is a key project partner and has worked with residents, churches, and other community organization to anchor the bridge park in a network of community gardens and other food systems initiatives that form the basis for the economic participation of Ward 6 and Ward 8 residents in the new 11th Street Bridge Park. To date, over 200 raised bed gardens have been built across 6 urban farm sites, which collectively are referred to as Bridge Park Plot’s. District residents are concomitantly learning to grow and prepare fresh, local food. Local residents identified the focus on the local food system was a top priority during initial planning meetings of the Bridge Park partnership. Requests included workshops and training in urban agriculture, food processing, and associated capacity building ventures, but also a desire for improved health outcomes, better education, jobs, business development, and the ability to be more self-sustaining in the long term. This gives the food production and food preparation activities of the 11th Street Bridge Park project a central role in ensuring that current residents in the anchor neighborhoods of the Bridge Park participate in the future success of the project.